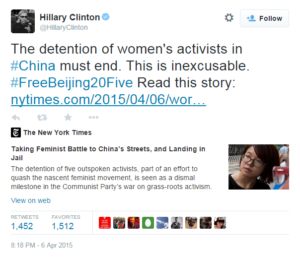 Hillary Clinton, the presumed 2016 Democratic front-runner for the nomination, tweeted support for human rights in China. But, as Secretary of State, her own record on improving human rights in China is mixed (at best). So can we believe she is genuine about human rights in places like China? Doubt it.